In our first 2019 refresh of this article we made some big changes to this long electro-acoustic chart! 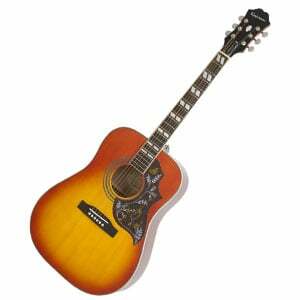 This included removing a few older models, such as the Fender Sonoran SCE and the Yamaha APX500III. In their places we added two unique Fenders – the Newporter Classic and the Tim Armstrong Hellcat – as well as a high-end Takamine EF341SC. We also saw the arrival of the Breedlove Solo Concert, the Washburn WCG55CE Comfort, and the new Yamaha APX600. Performing to a crowd? Recording a quick track? Can’t be bothered fussing around with microphones? It’s time to buy an electro-acoustic guitar! Do I Need an Electro-Acoustic? Can I Install My Own Electronics? Since the early 1910s, players and brands have experimented with adding electronics to their acoustic guitars, and have continued to improve and innovate these over the past century or so. These days, the range of electro-acoustics is unbelievable. In fact, it can be a little overwhelming, even if you are an experienced player. 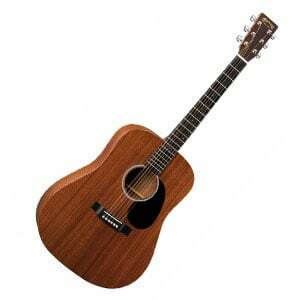 A higher-end electro-acoustic dreadnought with great versatility. Breedlove’s beautiful but unconventional electro-acoustic. Packing a top-notch mixture of quality tonewood and electronics. A great sounding acoustic with amazing electronics in a nice package. A higher-end acoustic with sleek electronics. Gorgeous detailing and a beautiful sound from this solid-wood Fender. Big comfort, style and tone from this Washburn electro-acoustic. An all-round angelic acoustic with stealthy electronics. The ultimate country guitar that both the new and experienced will love. Radical concert guitar from Rancid frontman Tim Armstrong. An affordable retro icon with quality modern upgrades. Unplugged sound that is good with plenty of sparkle with good electronics. An affordable compact electro-acoustic with Yamaha-designed preamp. A cool slimline electro-acoustic with a surprisingly low price. 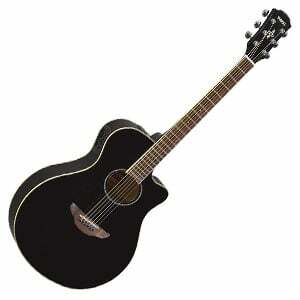 Superb value on offer with this stylish Ibanez electro-acoustic. New to this list is one of our favorite electro-acoustic models – the EF341SC, from the respected Japanese brand Takamine. It’s a high-end model, with a solid cedar top, layered maple body, beautiful neck and a premium glossy black finish. The tone of this dreadnought is warm and rich when unplugged, and retains that natural fullness when amplified. This is thanks to the quality Palathetic under-saddle pickup and Takamine-designed CT-4B II preamp system. It’s a very flexible system, offering 3-band EQ (bass, mid and treble), a volume slider, and a convenient onboard chromatic tuner. Great for stage performers. 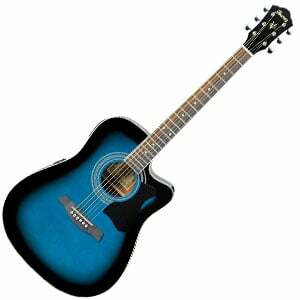 Check out more on this cool electro-acoustic in the full review of the Takamine EF341SC. The Solo Concert is an exceptional yet unconventional electro-acoustic from the popular Oregon-based brand Breedlove. Most notably, the body of this concert electro-acoustic features a second soundhole in the side of the guitar, allowing the guitarist to hear exactly what the audience is hearing. The design of the Korean-built Solo Concert is very elegant, while the American setup means it is perfect to play from the box. Which is exactly what you will want to do with this beauty – it’s great fun and sounds awesome. In the full review of the Solo Concert, we talk about the electronics. Admittedly, the controls are not the most versatile, but – with an LR Baggs system and USA-made quartz piezo pickup – it’s pretty solid! The DRS1 is an all solid wood acoustic electric from the fine people at Martin. The top, back, and sides, are all sapele, which is a highly sustainable tonewood that is similar in appearance and sound to mahogany. The Fishman Sonitone system is used for the electronics, which features controls hidden in the soundhole of the guitar. This means no hole needs to be cut into the side of the instrument for the preamp controls. Keeping with the forest friendly theme the fingerboard and bridge are both made from certified richlite. 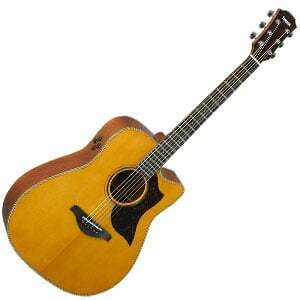 The Martin DRS1 is available in a left-hand model, and also comes with a ply hardshell case. This is a genuinely beautiful guitar with a great voice. 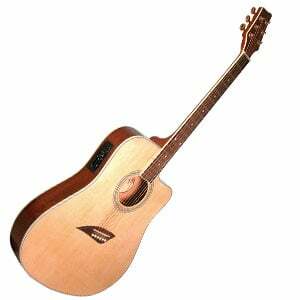 The GN93CE-NAT by Takamine features their NEX body, which is a scaled down jumbo. It sports beautiful features like abalone dot inlays, a rosewood headcap, gold die-cast tuners, and a gloss finish to show off the wood grain. It has a solid spruce top with laminate rosewood back and sides. The real star of this acoustic electric is Takamine’s own TK-400 preamp that includes a built-in tuner. There are lots of controls to shape and contour your amplified sound with a three band EQ, grain knob, mid contour switch, notch filter, and EQ bypass. This is a great sounding guitar whether you plug it in or not. The S.R.T. electronics fitted to Yamaha’s A3M electro-acoustic – part of the brand’s performance-focused A Series – are one of the highlights of this excellent guitar, taking advantage of both mic and piezo pickup input. This system also comes with a good 3-band EQ preamp that doesn’t leave much of a footprint on the side of the guitar. Which is good, because you wouldn’t want to spoil the elegant design of the A3M. With an all-solid-wood construction, Yamaha uses A.R.E-treated Sitka spruce on the top with mahogany on the back and sides for a wonderful tone. There’s also a very playable hand-rolled mahogany neck with a rosewood fretboard and 19 frets. Be sure to check out the full review of the Yamaha A3M. We arrive at the Newporter Classic, which is a stunning guitar from Fender’s distinctive California Series. The design and detailing of this mid-sized acoustic are just awesome – in fact, we gave it top marks in this section in our in-depth look at the Newporter Classic. With an all-solid-wood body (the classic pairing of spruce and mahogany), it features a gorgeous Cosmic Turquoise paintjob with a matching Strat-style headstock, as well as lovely koa binding and soundhole rosette. As for plugging this baby in, the pickup and preamp comes in the form of Fishman custom-voiced electronics. The controls aren’t the most versatile, but it is all reliable and sounds great. The built-in tuner is another good addition. When practicing for hours on end, or playing for long periods on stage, you may sometimes wish your guitar was a little more comfortable. The guys at Washburn have obviously been paying attention, because they have produced the excellent WCG55CE Comfort. As the name suggests, this electro-acoustic sports a comfortable armrest built into the side of the koa body, which really hits the mark with its rustic design, while the neck is made of mahogany and is great fun to play. It also features a very versatile Fishman Presys+ 501T system, which includes controls for volume and 3-band EQ, as well as notch, mic blend and phase. There’s more on this guitar in the full WCG55CE Comfort breakdown. New for 2018, the PRS SE A50E is a mid-range electro-acoustic that feels very high-end in its design, construction and tone. Featuring PRS’s Angelus body shape, this 25.3” scale length guitar is made with figured maple on the sides and back, and solid Sitka spruce on the top. With beautiful abalone flying bird fretboard inlays, rosette and purfling, there’s definitely some sparkle to this angelic model, which is matched by the bright, clear tone – replicated naturally through the Fishman GT1 electronics. This system isn’t the most versatile in controls, but its stealthy soundhole preamp keeps the guitar’s lovely style intact. A great buy! Check out more in the full review of the PRS SE A50E. 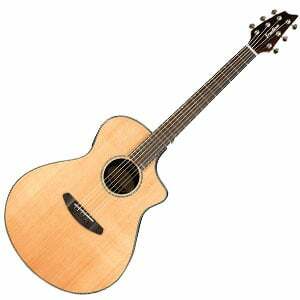 The 114E by Taylor is made with the company’s own grand auditorium body shape. The top is Sitka spruce with sapele back and sides. The neck is also sapele with an ebony fingerboard. 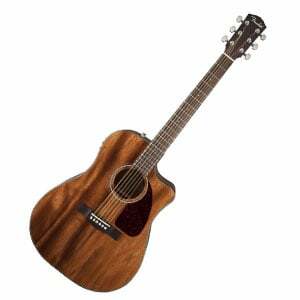 The Taylor 114E has a very clean and traditional look with a versatile sound. The electronics it uses is the ES2 pickup system that includes a volume and tone knobs on the upper bout of the guitar. There is a gig bag included with the guitar making it very portable. This is a great instrument for a beginner or as a backup for the more experienced player. This is a very sturdy instrument that can survive life on the road. We are big fans of this unique Hellcat from Fender – the signature electro-acoustic of Rancid frontman, songwriter and producer Tim Armstrong. For a very affordable price it features a full-sized but compact concert body, with a solid mahogany top and laminated mahogany back and sides. The detailing on the neck is very cool and just screams punk rock – the highlight being the striking Hellcat inlays running down the 19-fret walnut fretboard. As we highlight in the complete Fender Hellcat review, there’s a punchy but warm tone on offer, which is amplified nicely through the Fishman Isys III system. This preamp provides decent controls, including volume, 3-band EQ and a handy built-in tuner. There can’t be many more instantly recognizable acoustic guitars than the Hummingbird, and this beautiful Epiphone version is excellent for blues beginners. This vintage icon shows off great retro style, with the elaborately-decorated pickguard and the Faded Cherry Burst finish among other aspects. But it’s not just a pretty face – this Hummingbird has a great build and tone. The dreadnought body is made with a solid spruce top and laminated mahogany back and sides, while it comes loaded with impressive Epiphone electronics that make it a versatile instrument – one that any beginner can aspire to playing on stage. For all kinds of blues fingerstyle, flatpicking and slide, it’s a class act from Epiphone – as we elaborate on in the full review. 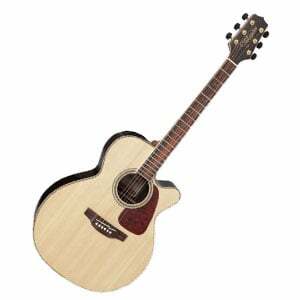 The Fender CD-140SCE has a solid Sitka spruce top with laminate mahogany back and sides. The neck is nato with a rosewood fingerboard. The bridge is also rosewood with a compensated saddle. The Fender/Fishman Classic 4T active onboard preamplifier also includes a built-in tuner. A tortoise pickguard protects the top from rough strumming attacks. 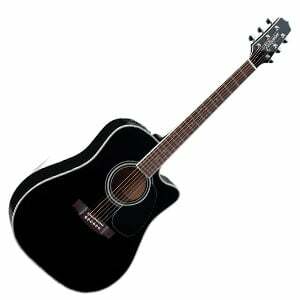 The body is a dreadnaught style with a cutaway which allows easier access to the higher strings. It has a built in tuner and 3-band EQ. The unplugged sound is good with plenty of sparkle. This is a fine instrument for playing live. Give the CD-140SCE a test drive and find out why we like it so much. Yamaha’s compact APX600 is the successor to the popular APX500III, albeit with a few upgrades and improvements that boost its playability and style even further. The guitar remains very similar to its ancestors, in that it features a slim body made from spruce and nato. However, the scale length has been reduced to 25”, which makes it even more playable – one of the reasons it is so popular with beginners. Of course, being on this page, it’s an electro-acoustic model, with a Yamaha-designed piezo pickup and preamp system, featuring 3-band EQ controls and a separate mid-range frequency slider. Check out the full review of the Yamaha APX600 for all the details! Guitarists searching for an electro-acoustic don’t have to pay over the odds when guitars like the Kona K2 exist. This slimline acoustic is great for travel and smaller-players, with a 3” deep body. Made of laminated spruce on the top and mahogany on the back and sides, the K2 looks great, with a dreadnought shape, single cutaway, and choice of pickguard style. While it could benefit from a setup, the overall fit and finish is pretty good for a sub-$100 guitar. Of course, being in this chart, it is loaded with electronics in the form of a basic piezo pickup and EQ-505 preamp with 3-band EQ. This is a guitar well-worth checking out – as we assert in our full Kona K2 review. One of the most affordable electro-acoustic guitars on this list, the Ibanez V70CE – that we’ve reviewed in full here – will appeal to beginners and players on a budget. With two color choices, it sports a full-size dreadnought shape with a laminated select spruce top, and mahogany back and sides. It sports a mahogany neck, with a rosewood fretboard and 20 frets, as well as an Ibanez-branded headstock with pretty good closed chrome die-cast tuners. The electronics on offer are also solid – the Ibanez-designed AEQ200 preamp with an undersaddle pickup, which comes with simple volume, bass and treble controls. It’s a no-frills guitar, but the looks and sound stand up to some of the others on this list. Great value. The answer here should be pretty straightforward. Do you want to amplify or record the sound of your acoustic guitar without using a microphone? If so, then yes – you need an electro-acoustic guitar! An acoustic guitar without electronics relies solely on the vibration of the body to project the sound. The inclusion of a pickup and preamp system allows you to use an amplifier to project the natural sound of the guitar or plug into a good audio interface to record, while also allowing you to add effects such as reverb, delay and chorus. If this is your first time looking for an electro-acoustic, you will find that fundamentally these guitars are standard acoustics with electronics added to them. This means that, even if you never plug it in, you still have a perfectly functional acoustic guitar that can be played unplugged. Ultimately, there is no harm in buying an electro-acoustic. You will have the same unplugged sound, but with the added bonus of being able to plug it in should you wish. However, as guitar manufacturers have to factor in the costs of adding pickups and preamps, electro-acoustics are naturally more expensive to buy. If you know that you will never plug your guitar in – and a version without electronics is available – then go for that one instead. The electro-acoustic you end up with will ultimately come down to your budget. It’s pointless in telling you to go for a guitar with a high-end LR Baggs pickup system if your budget is $150! However, in general, you won’t go wrong with a pickup and preamp system from the likes of LR Baggs, Fishman, or Seymour Duncan. In addition, you will find many great acoustic guitar manufacturers have developed their own electronics systems, such as Martin, Taylor, Takamine and Yamaha. Ultimately, you won’t be able to be too picky – if you want a Martin guitar with a specific Fishman pickup, then your choices will be limited or you may have to install it yourself (see below). When it comes to the systems in these electro-acoustics, most will be a piezo pickup with a preamp control panel on the side of the instrument, allowing you to tweak the volume and EQ. Some systems will be more limited, with controls hidden away inside the soundhole. If you do have a control panel, you will want to look out for volume and EQ controls, such as bass, middle and treble sliders/rotary knobs. On some more advanced systems you will also find controls for thongs like notch, mic blend and phase, which are particularly welcome if you are a stage performer. All good systems should offer a built-in digital tuner, allowing you to accurately tune the guitar without an external device or a pitchfork – perfect if you are sitting around a campfire! If you are buying an electro acoustic, you will need to remember that most preamps run off battery power, so always have a spare battery in your guitar case. Also, you will probably need to consider an amp – especially if you are planning to perform or gig, whether on stage, on the street, or in a coffee house. Unless you are just playing for yourself, an electric guitar amp won’t cut the mustard – a dedicated acoustic amp is required for the best amplified tone. You can check out our article on the best acoustic guitar amplifiers for some of our recommendations. You can indeed! Although it’s not something a beginner should – or really needs to – tackle. The problem is that, if you are installing a preamp with a control panel, you will need to saw part of the side panel out of your guitar – not a job for the fainthearted! You can buy good acoustic guitar pickups that require no major modification to your guitar, although if you want to purchase and install a bigger system you should follow a guide or take it to your local guitar pro to do it for you. As you’ve seen from our chart above, the range of electro-acoustics on offer in 2019 is just fantastic. Whatever your budget, and whether you’re an experienced stage performer or just starting your journey with electro-acoustics, we hope our list has given you a little inspiration. Just take the considerations into account, do some shopping around, read some reviews, and you should eventually be able to settle on an electro-acoustic that works for you. Good luck! How would you compare the Taylor Builders edition ($5,000) with the Ibanez 300 ($500)? I own the Ibanez and enjoy it. My dream is the Taylor Builders but my checkbook said 1/10th will work just fine! What are your thoughts in comparing the 2. Worth the price difference?